Epirus is a region in northwestern Greece. Unlike Trace and Macedonia, Epirus is not located by the Aegean Sea, but on the Ionian, the sea that washes the west cost of Greece. Epirus is mountainous, like most of Greece, and really beautiful, and it offers all kinds of types of tourism – forests, mountain lakes, slopes, beaches, and a lot of cultural, historical, and religious sites; and if you are interested in sports, you can go rafting, canoeing, or kayaking. So you might be crossing through Epirus, and wondering what would be nice to see there. I will offer you a helping hand and take you to some very interesting places. The Aoos River is a relatively long river for Greece, and it originates in Albania and runs through Greece. If you like nature you can enjoy the sight of it, while if you are a bit of an adrenaline junkie you might take in some rafting on the river! Which sounds super fun (for those who like that kind of fun, for others I will find some alternatives). 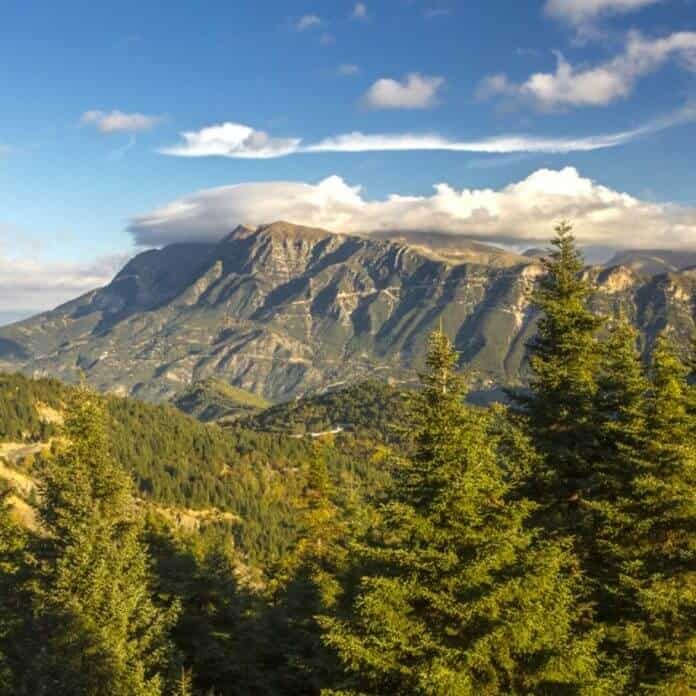 For the nature lovers there is more, and for the hikers, too – both can enjoy the beautiful scenery of the Pindus mountain range. Pindus is also called the “spine” of Greece, because it is located somewhat in the center of the peninsula, but also it defines the border between Epirus and Thessaly (which I will talk about in the next article). On Pindus there are two large gorges which are among the most famous in Europe: the Vikos Gorge (listed as the deepest gorge in the world by the Guinness Book of Records, among others) and the Aoos Gorge. Also, for the animal lovers – this is one of the rare areas where the Dalmatian Pelicans live, besides spoonbills, other pelicans, wolves, bear, and jackals. Furthermore, the flora of the Pindus is very rich and mixed. In case you are wondering, the territory is protected against encroachment as it is the location of two national parks: the Vikos-Aoos and the Pindus national park. While we are still somewhere near the Aoos, we can visit Konitsa, a town located on the banks of two rivers – the Aoos and the Voidomatis, built like an amphitheater down the sides of Pindos. You can see the remains of history in Konitsa, although it has only about 6500 inhabitants. One of the remains is a very famous bridge built in the 19th century, also we can see the ruins of a mosque left over from the Ottoman Empire. During the Ottoman period, some of the Greeks in Konitsa converted to Islam, so the lower part of the city was mostly inhabited by Muslims while the upper part was mostly inhabited by Christians. The city was in many periods touched by important historic events like the middle bronze age, when the proto-Greeks lived there, then as a possession of the Ottoman Empire, and lastly in the Greek civil war when Konitsa was a battle ground. Also, near Konitsa you can find many Orthodox Christian churches and monasteries, some of which are: the Monastery of Molivdovskepasti, the Μonastery of Stomio (built on a nearly vertical rock), the Church of the Saint Apostles (all of the monasteries are between 10-20kms away from Konitsa), or you can just go and visit the Church of Saint Nikolaos in Upper Konitsa). This is the Capital and the largest city of Epirus, with a population of around 100.000 citizens. The city was founded by the famous Byzantine Emperor Justinian far back in the 6th century. It is located on Lake Pamvotida, which is the largest lake in Ioannina. The name of the city means “City of John” for those who were wondering. In “the City of John” you can find many interesting places and sites … a Jewish synagogue, for example, as Ioannina had a Jewish community, then we have Orthodox Christian churches, mosques, and also the Ioannina fortress and Ioannina Island in the middle of Lake Pamvotida. To visit the island you can take a boat ride lasting 15minutes and see the island for yourself, and maybe visit some monasteries as they are very common in Greece. One of the monasteries on Ioannina Island has been made into a museum. Ioannina is famous for its silverwork, which is often cheaper in Greece than in other parts of Europe. When talking about silver – there is even a silversmith museum in the city. Other museums in the city, for all those history lovers, are Ali Pasha’s museum, the Archeological museum of Ioannina, the Military museum, and art galleries. If you want to try to relive some historic events you can visit Dodoni – an archeological site that shows us a theater and possibly the oldest sanctuary in Greece. In Ionnina you can take a break in many pubs and cafes or even go to a night club as Ioannina has a very lively night life scene. Igoumenitsa was known in history as Titani, but nowadays it is best known as a very important port that connects the mainland with the Ionian Islands and Italy. Igoumenitsa is a rather small city with a nice promenade to enjoy, but its main purpose is visible from every point in the city – the port. In addition, it has an archeological site and museum that can show and represent in the right way the history of Igoumenitsa. Preveza has beautiful things to offer. Other than beautiful houses and a fairytale look Preveza gives you . . .
All you hedonists should head to Preveza. Preveza is a pretty, colorful city located by the sea. Preveza has had many cultural influences, from authentic Greek, Bulgarian, Serbian, Albanian, Ottoman, French, Italian and even German in WWII to the modern era. In Preveza you can enjoy long walks by the sea or in the labyrinth of streets, or you can just sit and enjoy a good meal in some of the taverns … during your stay, be sure to explore the beaches surrounding Preveza. This is a city located in the foothills of the Pindos Mountains. It is an old town which preserves its traditional look. You can spend your time in Metsovo exploring its streets and enjoying its architecture. While you’re there I suggest that you visit the Folk Art Museum and the Averofeios Garden, where the native trees of Pindos are growing. Also, near Metsovo you will find two monasteries on the banks of the Metsovitis River: the Monastery of Panagia and the Monastery of Agios Nicholaos with its 17th century wall art. Around Metsovo you can find many small villages like Atochori, which is famous for its old mills which have been made into a Hydrokinetics museum. Metsovo is small, but for its size it has quite a lot to offer. Only around 6000 people live in Metsovo. Yet another of the many beautiful places on the Ionian Riviera, Syvota is a place made for relaxation. It is surrounded by a clear cyan sea and many small islands. In Syvota you have many beaches to choose from. The city is very small, it is inhabited by only around 1000 people, but that doesn’t mean that it isn’t filled with tourists from all over Greece and the World, who come to enjoy the sandy beaches, calm and romantic nights, a small and intimate town, and long walks by the sea. What more can a man ask for during a vacation? Epirus is famous for its milk products, especially cheese. You can find many sorts of cheese, like smoked metsovone cheese, anthotyros (an almost salt-free cheese), spicier vasilotyri, galotyri (creamy, strong-tasting cheese), the hard and spicy kefalotyri, or the salt-free Manouri. Then you can also find a wide range of pies, which are very common in Epirus, as well as sweets. When it comes to sweets you can find baklavas and kataifi (kadaif) filled with almonds or walnuts soaked in thick syrup. Also, don’t miss the great wines of Epirus. Of course, when preparing for a trip you have to stay somewhere, don’t you? So here is some info about accommodation in Epirus. In general, when searching for accommodation in Greece, be sure to visit many websites. The reason for this is that the lower prices for bed & breakfast accommodation range from 30-50e per day, but if you dig a little deeper, and want to keep to a lower budget, you can always find places and rooms to stay for around 20e (which can make a difference if you are staying, for example, a week), and just because the places are cheap or cheaper doesn’t mean they aren’t nice. In Greece a lot of effort is devoted to tourism, and Greek hospitality is a big bonus and a guarantee that you will be treated well.